Recently I was sent a Dell Venue 7 ( 7 inch) tablet for review. Its been couple of weeks with the tablet and I have been using all its features and hope to share my thoughts on the tablet in upcoming posts. One major activity with this tab is browsing recipes and checking youtube. I have this habit of playing music while I cook, usually my mobile phone did that job but every time I get a call the music used to stop halfway grrrr. But not anymore, I found this Dell tab handy and I was totally loving the screen size. 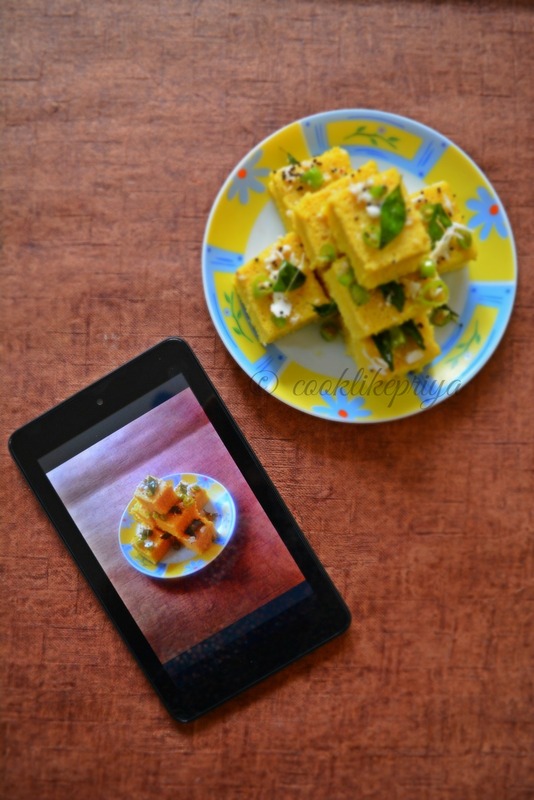 Dell Venue tablet is great for browsing and silly me clicked some pics of the finished dhokla with the tab :-) having 16GB, I have to, don't you think so?. Scroll down to view the images. Its Intel Atom Processor ( 1.6 GHz) is simply amazing and makes browsing so fast. Although there are two cameras (front & back) they are good for skype/ video calls but I found their quality to be little not up to expectations. Obviously a down down for a food blogger. But nevertheless the hi speed browsing is definitely a thumbs up. I hope to share more of my thoughts and experiences with Dell Venue in few of the upcoming posts. :-) Do drop in your comments and let me know if you are using this tab/ plan to own one soon. 1. 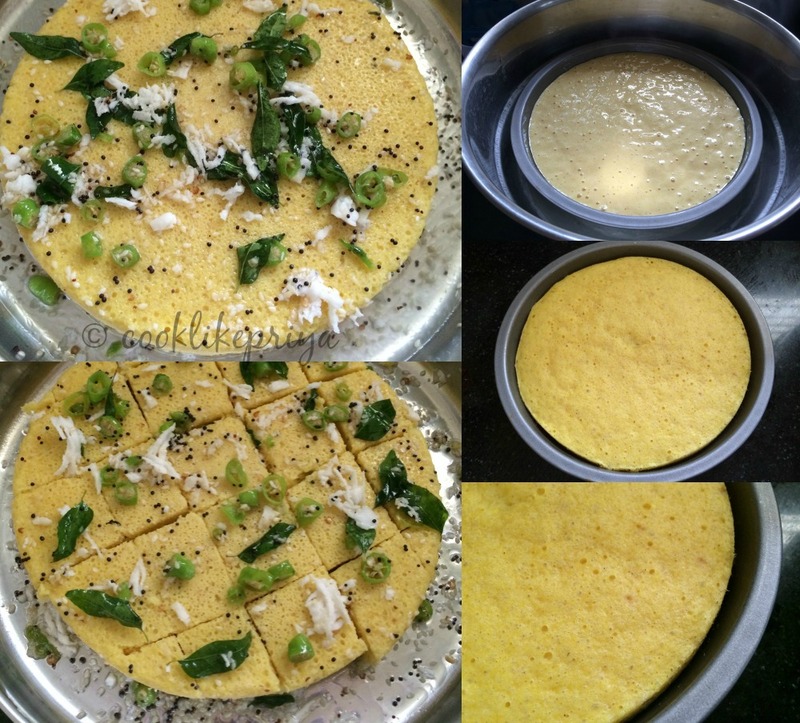 In an idly cooker heat water and prepare a baking tin (cake tin) or any flat plate to set the dhokla. Grease the plate with oil and set aside. 2. In bowl combine gram/ besan flour, hing, semolina/ sooji salt and set aside. In a mixer grind ginger and green chilli paste and this to the flour mix. 3. Add the curd/yoghurt and using a hand whisk mix the flour well. Now add water little by little to form a smooth batter without lumps. 4. The consistency will be that of dosa batter that is thin yet not watery. 5. Add salt, lemon juice and check the taste. 6. Now mix in the eno fruit salt and pour into the prepared tin. 7. Place the tin in the plate of the idly cooker. Cover the lid and let it cook for 10-13 minutes until cooked. 8. You can check if its cooked by inserting a skewer/ toothpick and it must come clean. 9. Now prepare the tempering - heat oil in a kadai, once hot splutter the mustard seeds, green chillis, curry leaves, sesame seeds and grated coconut. 10. Add 1 tbsp of sugar and 1/2 cup water to this and heat till the sugar dissolves. 11. 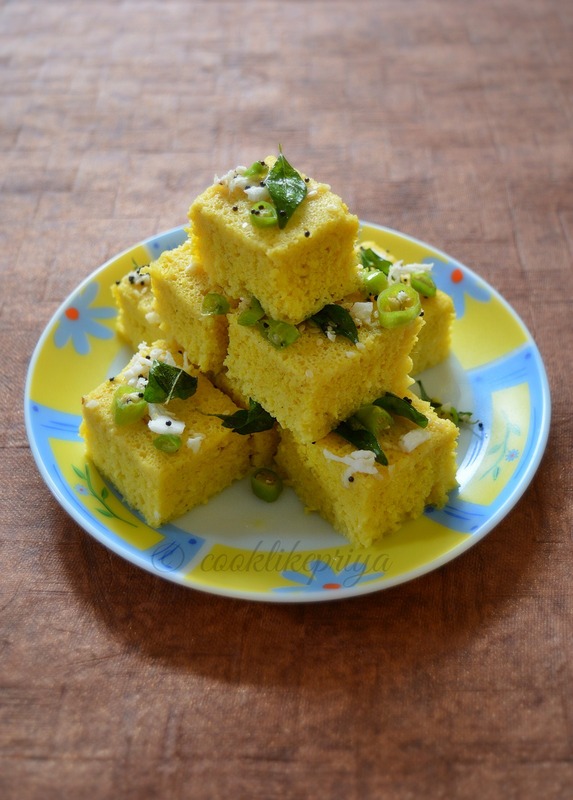 Transfer the dhokla to a plate and pour the tempering over it. 12. After a minute the dhokla will absorb all the water. Cut into squares and serve along with green chutney or spicy tomato ketchup. 1. The batter needs to me set to steam once the fruit salt is added so do not let the batter sit for long. 2. 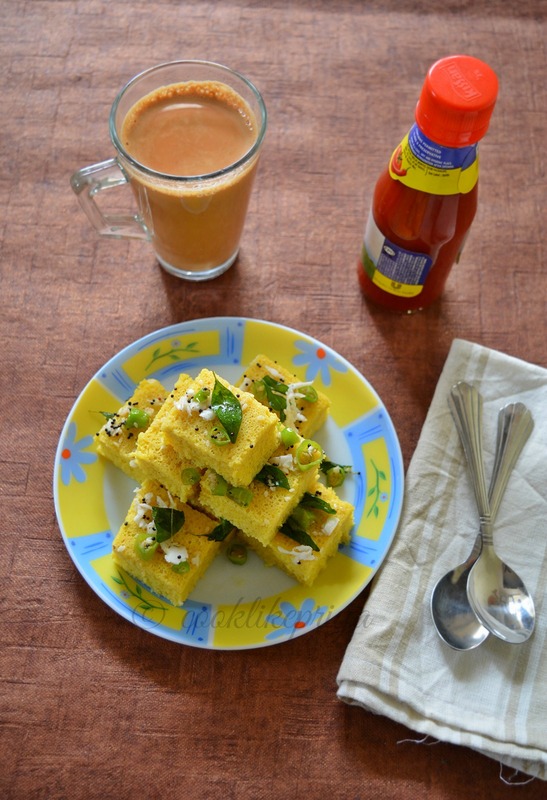 You can skip turmeric if you want your dhokla to turn white, either ways it tastes great. 3. Make sure you taste the batter before steaming it, check for salt and spiciness. 4. Sieving gram flour before preparing the recipe avoids lumps in the batter. Else use a hand whisk to remove lumps. 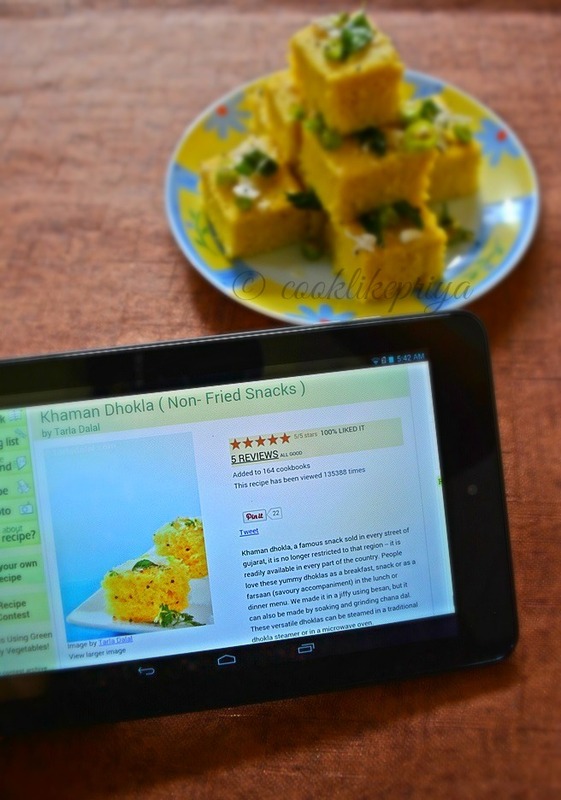 wow thats an wondeful review and love that pic of khaman dhokla from tab :) khaman dhokla looks fantastic and so spongy dear :) Fantastic review post !! Ooooo one of my favourite dish,looks very soft like sponge love or presentation. 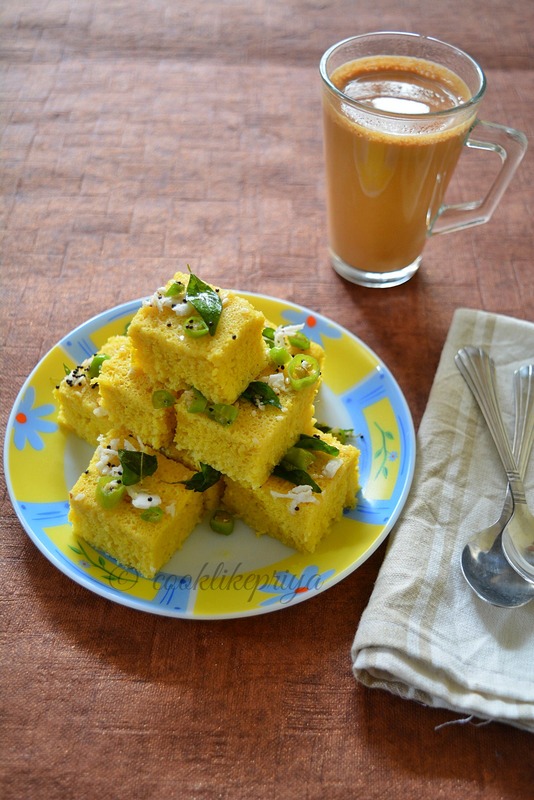 Love this soft and spongy dhokla..looks sooo yummy..
Amazing pics. Now u have made me khamand hungry! the looks soo neat, Priya...and well presented too. Fantastic review sis, kalakura po.. 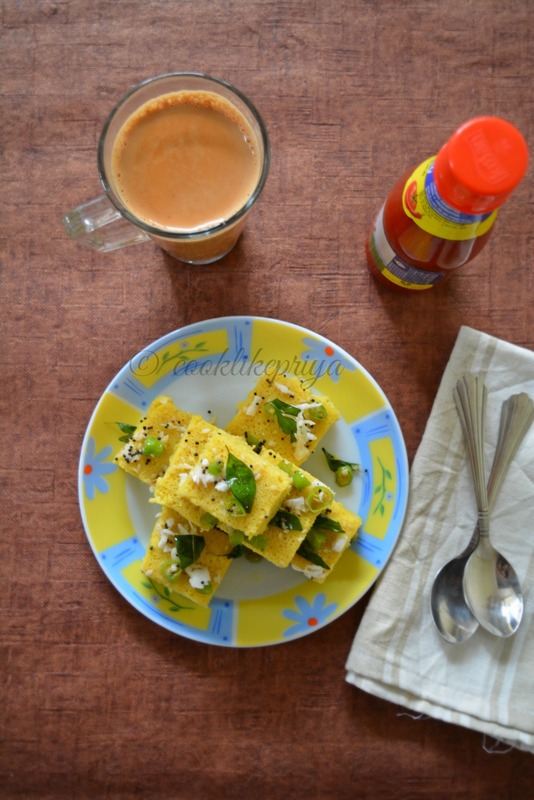 I would love to have some dhoklas rite now for my snacks. Nvr had it before but looks tempting! Can we replace Eno with baking soda..?